Spring is finally here- and so are the weeds. Fight back with some of our fast, efficient, back-saving weeding tools. 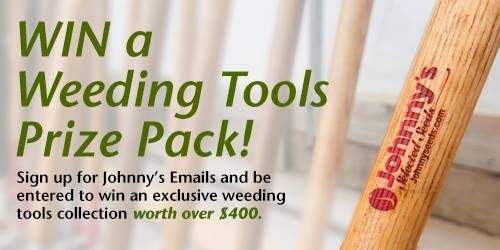 We’re giving away an exclusive Weeding Prize Package, including a Standard Collinear Hoe, Trapezoid Hoe, Wire Weeder, set of (3) Tubtrugs and a Johnny's gift certificate! Every person who “shares” this Facebook status will ALSO be entered to win a 2nd prize - a Stirrup Hoe! To enter to win the prize package, simply sign up to receive our emails here. Already actively receiving Johnny’s emails? Then you’re already entered! Don’t forget to “share” our Facebook status here to be considered for the Stirrup Hoe as well! We will draw winners for both prizes on Monday, June 16th. Good luck!